Jespa Awomah was used to seeing children cry or run away when they saw him. In his small, mostly pagan village in Cameroon, Africa, his condition was viewed, even by his family, as a curse. When he met people for the first time, he kept his eyes and head down. Everyday since he could remember, Awomah prayed for the same thing. “I prayed that if it was God’s will, I would remain as I am. But if it was not God’s will, that something would happen,” he says. Rebecca Akumbu grew up in Awomah’s village and moved to a larger city where she attended college and law school. In 2012, while working for Plant A Seed Africa, a former classmate sent her a photo of Awomah. Plant A Seed provides books and school supplies to African children. Awomah was born healthy, but at 10 months old he crawled into an open fire pit inside his family’s hut. The closest medical care was a three-hour walk away. His mother made the journey on foot, holding Awomah in her arms. The most the one-room clinic could provide was a few bandages. He returned home to recover from his extensive wounds, which took the sight from his right eye, damaged his left eye, fused his forearm to his bicep, and twisted his fingers backwards toward his wrist. The fire also disfigured his ear. Hair no longer grew on the right side of his scalp. Rebecca shared the photo of Awomah with her sister Ruth, an El Segundo resident and founder of Plant A Seed Africa. Ruth and friend Rashel Mereness, an entertainment attorney from Hermosa Beach, were planning a trip to Cameroon for Plant A Seed. They decided to pay a visit to Awomah’s, where he lived with his 12 siblings. During their meeting, he made one simple request — books — so he could attend school. Awomah was 12 at the time. 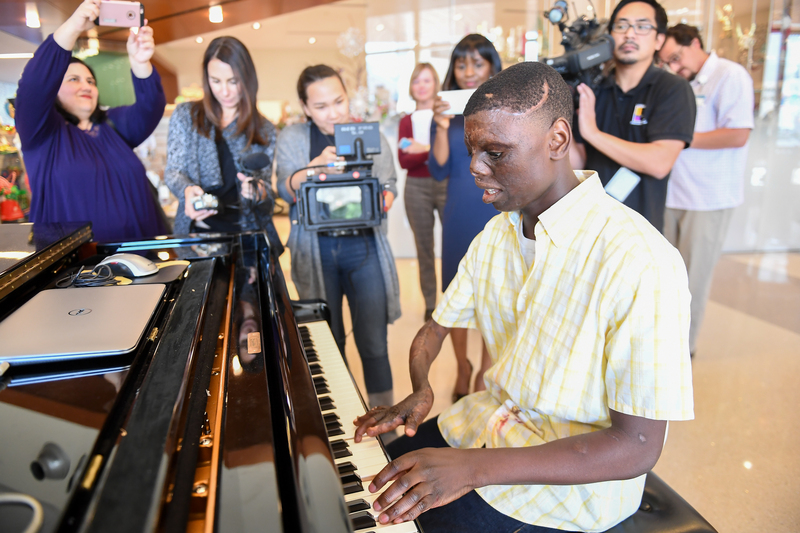 Jespa Awomah puts his newly reconstructed fingers to use at the piano at Torrance Memorial. Rashel videoed Awomah and posted the video on Facebook with a plea for help. Two years later, in March of 2014, I spotted a Facebook repost on Mereness’s feed. I forwarded the post to Naiwei Hsu-Chang, RN, a unit lead in the Burn Intensive Care Unit (BICU). She sent it to Tanya Sorkin at the Children’s Burn Foundation (CBF). The Torrance Memorial BICU staff wanted to help Awomah but knew the cost of his surgeries and rehabilitation would be in the seven figures. CBF offered to sponsor his treatment. Nearly two years later, an agreement was reached to fund Awomah’s medical care at Torrance Memorial at a deeply discounted rate. Ruth agreed to host Awomah in her home, and Rebecca decided to travel to the United States with him to be his caretaker. 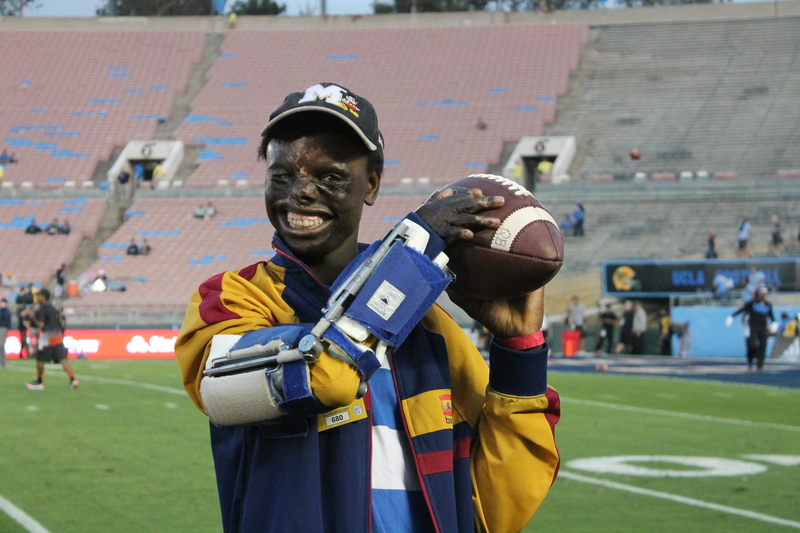 In October 2015, 16-year-old Awomah arrived in Los Angeles and met with Vimal Murthy, MD, medical director of the Torrance Memorial Burn Center, and Matthew Reiss, MD, burn and reconstructive plastic surgeon. Awomah carried a rag to wipe his functional left eye that constantly teared. Ruth said he slept with that eye open because his eyelid wouldn’t close. Dr. Reiss’ believed he could release and extend Awomah’s right arm, rebuild both of his eyelids and possibly restore some function in his right hand. He could also extend his scalp to even out his hairline. As final cosmetic touches, Dr. Reiss recommended Awomah receive a prosthetic right eye and skin tattooing to even out his scarred complexion. “My biggest hope for Jespa is that at the end of his treatment, he will be able to shake hands with me using his right hand,” Dr. Reiss said. In December 2015, as Dr. Reiss unwrapped Awomah’s post-surgery bandages, Awomah shrieked in pain. Then, at the sight of his new hand, he smiled through his tears and said, “I have a hand. I have a hand. 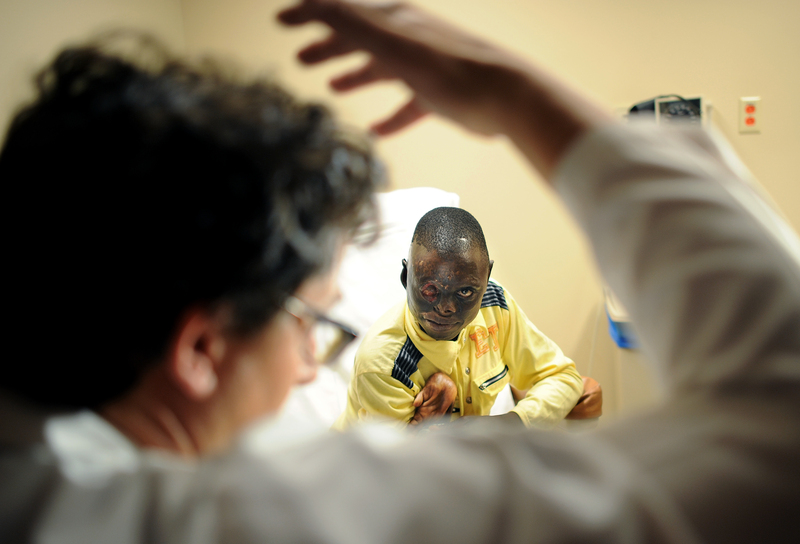 My prayers have been answered.” Dr. Reiss gave Awomah’s new hand a gentle first shake. “When he sees what we’ve been able to do — watching his excitement and happiness about it — it’s priceless,” Dr. Reiss says. 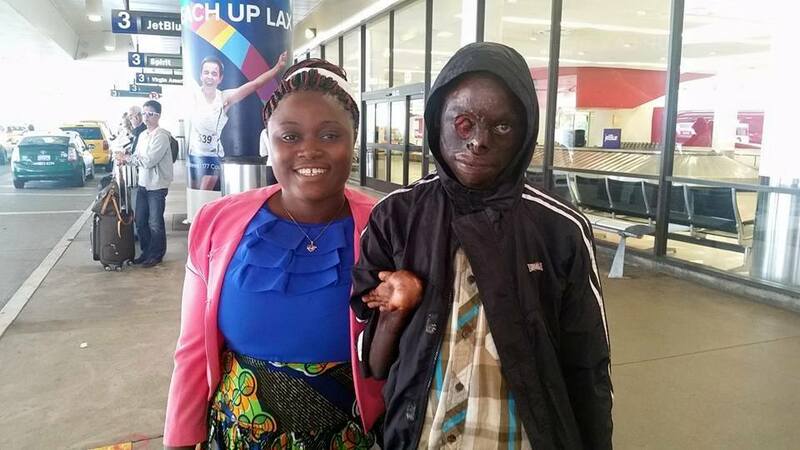 Over the following 12 months, Awomah underwent another eight painful surgeries, always waking with a smile. Ocularist Sarah Haddad, B.C.O., B.A.D.O., gave him a prosthetic right eye to bring symmetry to his appearance. Matthew Reiss, MD, burn and reconstructive plastic surgeon at Torrance Memorial explains the plan of care to Jespa Awomah. Last May, at age 19, Awomah graduated from Arena High School, an alternative school in El Segundo that offers an online learning environment supported by classroom teachers. “Jespa came in and he taught us more about perseverance, grit and positivity than anyone ever has,” said Marisa Janicek, Arena High’s principal at the time. Fellow Arena students took Awomah under their wing. “An incredibly popular and busy senior took the time to organize a birthday party for Jespa and even arranged for a cake,” Janicek said. The El Segundo School District awarded him its Every Student Succeeds Award. The award is presented to students who have achieved something above and beyond what is expected. He was also a finalist for the statewide Every Student Succeeds Award. His Southern California experience has included camp with other young burn survivors, a surf lesson (he stood up! ), bike rides on The Strand from El Segundo to Palos Verdes, and piano and swim lessons. Dr. Murthy arranged for him to attend a UCLA football game (Murthy’s alma mater) at the Rose Bowl, and a meeting and hoops session with the Los Angeles Lakers. Since his arrival in the United States, Awomah has grown from 5-feet-2 to nearly 6-feet. He once believed this journey might require removal of his right arm, but he can now bend it and use his fingers. He is now a straight A student at El Camino where he is studying biology. He has his sights on becoming a doctor or a pilot so he can help his brothers and sisters back home, along with others in his situation. Scholarships from the Eagles of Eighty-Two (an El Segundo High School alumni group), and the Masons are helping pay for his books and tuition. Jespa Awomah with his team (left to right) Carol Horvitz, executive director of Children’s Burn Foundation (CBF), Rashel Mereness, Tanya Sorkin (formerly of CBF), Vimal Murthy, MD, medical director of the Torrance Memorial Burn Center, Matthew Reiss, MD, burn and reconstructive surgeon for the Torrance Memorial Burn Center, Rebecca Akumbu, Janice Dunn (formerly of Torrance Memorial Burn Center), Colleen Farrell, marketing and communications manager at Torrance Memorial Medical Center, and Ruth Akumbul. Awomah continues to live with Ruth and Rebecca. He borrows Ruth’s car to attend his El Camino classes and is looking for a job so he can buy a car of his own. Ruth is working on a doctorate in global leadership and change at Pepperdine University. Rebecca is studying for the California bar exam. 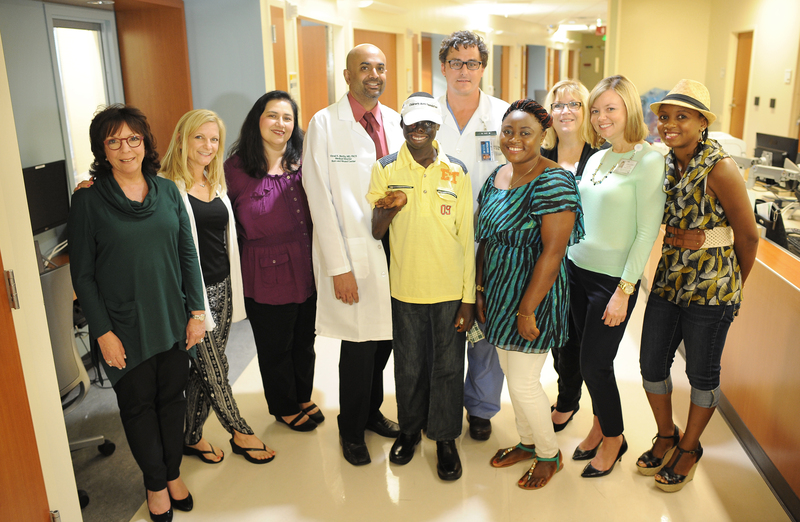 Following his surgeries at Torrance Memorial, Dr. Lori Kathryn Howell, a pediatric plastic surgeon at Children’s Hospital Los Angeles performed procedures on Awomah to further restore his nose, ear and hand. El Segundo optometrist Michele Rogers, OD, fitted him with eyeglasses to correct astigmatism in his still functional left eye. Dr. Gloria Chiu, OD, chief optometrist at USC’s Roski Eye Institute, fitted Awomah with a special scleral PROSE contact lens to provide better comfort and vision in his left eye, which was scarred from chronic dryness due to its burned eyelid. Because Awomah will soon turn 21 and is not a U.S. citizen, his state insurance coverage may end. Ruth and Rebecca have set up a GoFundMe account to pay for Awomah’s medical care and living expenses. 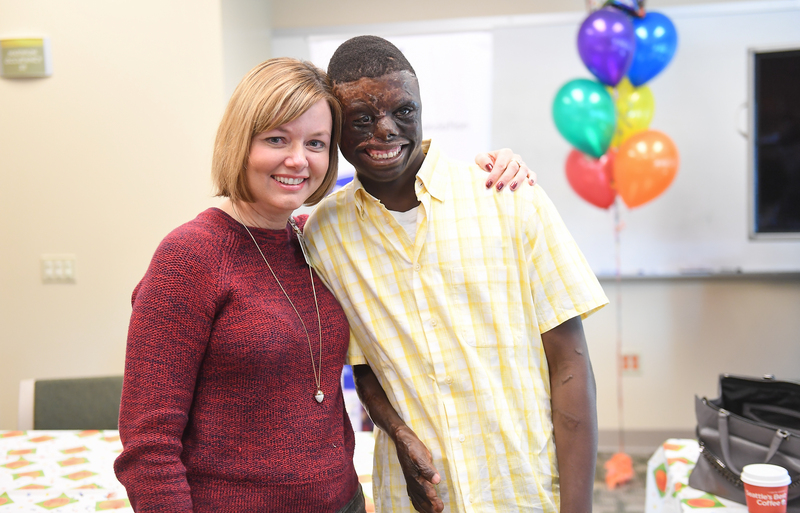 Jespa Awomah with Torrance Memorial marketing manager Colleen Farrell, who learned of Jespa on social media and recommended him for treatment at Torrance Memorial Medical Center. Colleen Farrell is marketing and communications manager at Torrance Memorial, a hospital with one of the three American Burn Association’s Verified Burn Centers in LA County).